The European Foundation of Human Rights (EFHR) would lke to inform you about our workshops on the international protection of human rights which took place from November 26th tol December 3rd in five schools in Vilnius and the Vilnius Region. October saw the last cycle of workshops at schools – 15 workshops were prepared for over 500 students. The workshops began on November 26th at Lipówka Primary School in Vilnius (grades 9 and 10) and at Wł. Syrokomla High School in Vilnius (grade 10). 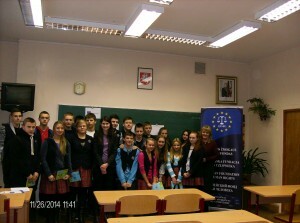 On December 1st we visited pupils from grades 9 and 10 at the High School in Czekoniszki in the Vilnius Region. On December 2nd we had a meeting with pupils from the 9th grade at J.I.Kraszewski Junior High School in Nowa Wilejka. On December 3rd we ended the cycle of the workshops with a meeting with pupils at S.Konarski High School in Vilnius. During the workshop the students learned about basic human rights, the most important international rules for the protection of these rights, as well as the usual practices at the international level. EFHR would like to thank the schools and teachers who were involved in this initiative. We are glad that we can contribute to the legal education of pupils, and in that way take part in the process of raising awareness of our rights.